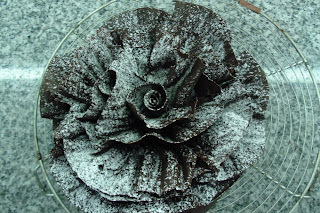 Basic components of this cake were 3 chocolate meringue disks and chocolate mousse. The disks were arranged in layers. 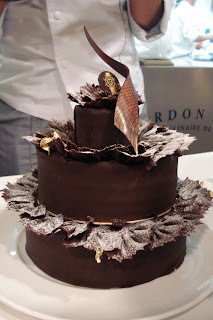 Each layer was covered with chocolate mousse. The whole cake was then wrapped with a band made from melted chocolate. 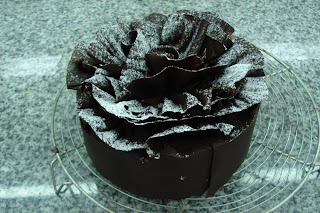 The top was covered with chocolate fans. What are bands and fans? You might wonder. They are 58% chocolate melted in a bowl placed over simmering water ( Bain marie as the French say). When the chocolate reached 50 degrees celcius, it was poured in to a tray and spread out until the entire surface of the tray was covered. (If using a cookie sheet, use its backside). The chocolate was chilled to set. 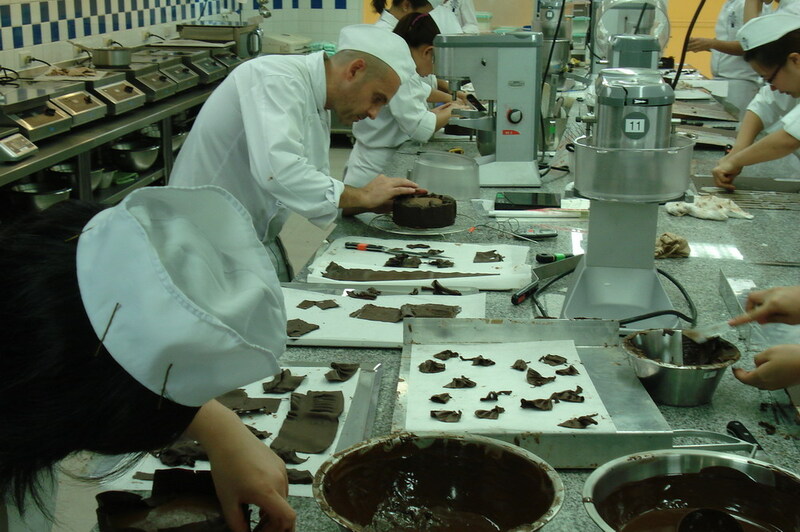 Once the chocolate became firm, it was removed from the chiller and was left at room temperature to soften. How soft? Soft enough that when you scrape it you don't feel any resistance. 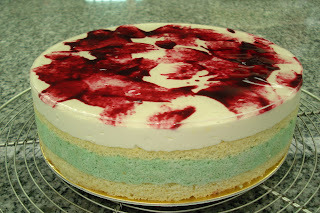 A 3-layered cake, sides decorated with fans...made by Chef Willy. His fans were way better than mine. My chocolate fans. Sprinkled with icing sugar. It took us ages to make fans enough to cover the entire surface of the cake. As a matter of fact, making it took much of the 3-hour -long practical. The whole class were busy scraping.... Fans were the ones in the middle. You can scrape with a scraper or a fillet knife. Rectangular ones were the bands. But being a novice and all, I would say I pride myself on accomplishing something I thought I couldn't do! Basically, Cassis Vanille has a base which is made of ladyfinger biscuit. For the band, the batter is separated into 2 portions. One is added with blue food-color, the other is just plain. These two are piped alternately crossways into the tray. The rest of the plain batter is piped in to a disk for the base. The band (wall) and base are imbibed with blackcurrant syrup. Blackcurrant jelly is then poured over the base. Vanilla supreme is poured over the jelly. 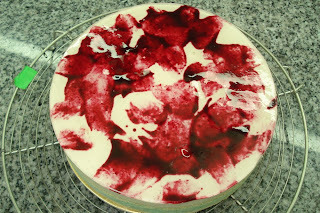 Any leftover jelly can be used to create a design on top of the cake. What I did was poured the jelly and shaped it into tadpoles. I wasn't quite pleased with the uneven sides and didn't want to present an unattractive cake so my friend Naung came to my rescue, took my teaspoon and slid it across and this how it came out. Beautiful isn’t it? Use blackcurrant glaze or neutral glaze added with some food color for a shiny look. Intermediate Patisserie Class 3 with our instructor Master Chef Fabrice Danniel.